Full Moon Ghee is Hannah Jacobson-Hardy and Daniel Rainwater. Three years ago, we met while studying yoga and Ayurveda at the Kripalu Center in Stockbridge, MA. Soon after, we began making ghee for our friends, and everyone loved it! We decided to rent a small community kitchen in the Pioneer Valley to offer the ghee at a local farmer’s market. 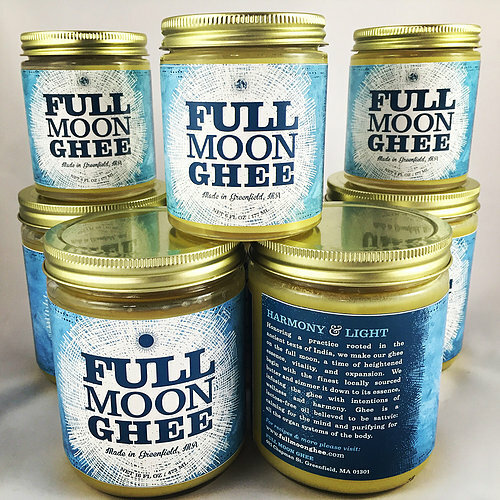 As the demand grew, Full Moon Ghee spread to local stores, restaurants, and the online marketplace. We are grateful for the opportunity to offer ghee to our community and the greater neighborhood in the Northeast. Through our service, we hope to strengthen our collective connection to this an ancient tradition rooted in healing and reverence. Ghee clarified butter, a lactose-free, shelf-stable, high-heat cooking oil with origins in ancient India. To make our ghee, we begin with butter that comes from healthy, happy Jersey cows in Western Massachusetts. We slowly simmer the butter, removing the moisture, the milk solids, and the impurities. What remains is a pure premium cooking oil: the clarified essence of butter. Our ghee has a rich, sweet, slightly nutty flavor.